Basic cobalt and copper carbonates were prepared by precipitation from solutions of their nitrates using KHCO3 at room temperature in CO2 atmosphere. 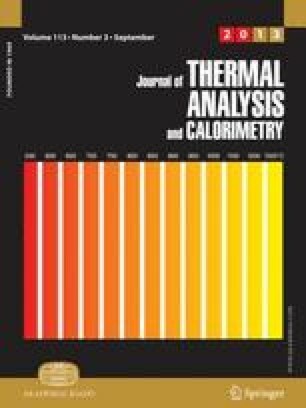 The thermal decomposition of the prepared basic carbonates was studied by means of TG and DTA techniques and the phases produced were identified by XRD measurements. The products obtained at 400‡C were subjected to different doses of gamma-rays (40–160 M rad) and the thermal stabilities of these solids were investigated. The results obtained revealed that basic cobalt carbonate decomposed at 335‡C to produce Co3O4 which remained stable up to 850‡ and then decomposed above this temperature giving CoO which transformed into Co3O4 on cooling to room temperature. Basic copper carbonate dissociated at 290‡C yielding CuO which yielded Cu2O and metallic copper at 1060 and 1150‡C, respectively. However, the produced cuprous oxide and metallic copper solids were converted into CuO and CU2O, respectively by cooling in air to room temperature. Gamma-irradiation decreased the thermal stability of Co3O4 to an extent proportional to the dose employed. On the other hand, this treatment increased the thermal stability of both CuO and Cu2O.